Our beautiful Southwest Chapel offers comfortable facilities, a caring and compassionate staff and attractive surroundings. 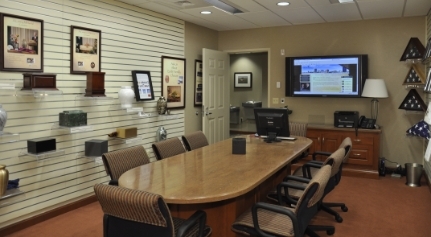 Built in 2010 to serve the families of Southwest Toledo, our funeral home was designed with you in mind. It includes two large, beautiful chapels for funeral and memorial services, a variety of tastefully appointed rooms for family and friends to gather, and a large, well-lit parking area. 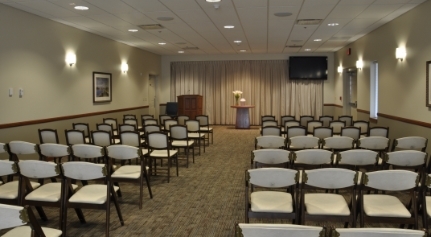 Our Garden Rooms offer a beautiful, convenient place to gather with refreshments during your visitation or before or a funeral or memorial service. Just a few steps down the hall from our chapel, your family and guests will appreciate the time to share memories and spend time together, without the need to travel to another venue. We will provide tableware and assist with set-up and clean-up. You can bring in your own refreshments or select one of our catering packages. Custom menus are also available. Please give us a call for more information or download our information flyer. Managing Funeral Director Jim Raczkowski is a life-long member of the Toledo community with deep family roots in the area. Jim and his wife, Amy, have one son, and are members of St. Patrick of Heatherdowns Catholic Church and St. Hyacinth Catholic Church. He entered funeral service out of a deep desire to help others in their time of need. Jim is a member of the Northwest Ohio Funeral Directors Association and enjoys spending time with his wife and son and annual trips to Disney World.